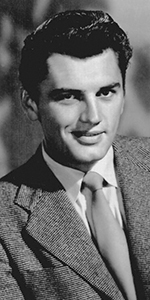 Edmund Purdom was an English actor brought out to Hollywood to star in historical films. His career followed a different trajectory however, with Purdom living in Italy for many years. Born in a village to the north of London, Purdom went to school at St. Augustine's Abbey School in Ramsgate, Kent, then attended the Jesuit-run St. Ignatius Grammer School. He must have encountered the stage during this time. In 1946, Purdom joined the Northampton Repertory Company, appearing in Shakespeare's Romeo and Juliet and Moliere's The Imaginary Invalid. This was followed by two years serving in the Army Pool of Artists as part of his military duty. When he joined the famous Royal Shakespeare Theatre in Shakespeare's hometown of Stratford-upon-Avon for a couple of years, Laurence Olivier asked Purdom to join his company, then preparing to tour the United States. December, 1951, found Purdom making his Broadway debut as the Persian in Shaw's Caesar and Cleopatra with Olivier and Vivian Leigh. While the play ran for only 67 perfs, the production was seen by a Warner Bros. scout, who brought Purdom out to Hollywood to make a test, but the studio didn't sign him up. Broke, Purdom returned to Broadway, hooked up with Olivier again, and in December, 1952, Purdom took the role of Thyreus in Shakespere's Antony and Cleopatra, again with Olivier and Leigh in the title roles. Returning to Hollywood, Purdom caromed about the studios, until he got a small role playing Strato in director Joseph L. Mankeiwicz's film of Julius Ceasar (released in June, 1953). Director George Cukor suggested to producer Charles Brackett that Purdom would be good as Charles Lightoller in Titanic (which played the Chinese in April, 1953). M-G-M finally signed the strapping actor to a contract. When Mario Lanza was fired from The Student Prince (released in June, 1954), Purdom stepped into his role (lip-syncing Lanza's vocals). He did so well in Student that when Marlon Brando dropped out of a film over at Fox, Purdom stepped into that role as well. The Egyptian (which played the Chinese in September, 1954) was a expensive, large-scale production, with Purdom in a pivotal role along with Jean Simmons and Victor Mature. M-G-M was thrilled Purdom was in such a high-profile picture. Although Purdom didn't really think he deserved the honor of a Forecourt ceremony, and pleaded to all and sundry against his having to participate, Darryl F. Zanuck, the film's producer, insisted upon it, and so, two days before the film opened, Purdom was guided through the Forecourt proceedings, but he always regretted it. 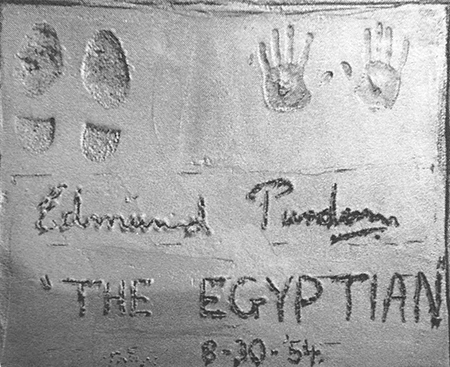 (His footprints were removed and replaced with those of Yul Brynner, which were done at the Fox studio, so no one relaly noticed the removal of the Purdom prints. As The Egyptian, Purdom was a big success, so M-G-M shoved him into the musical Athena (released in November, 1954), The Prodigal (released in May, 1955), and The King's Thief (released in August, 1955). Purdom was considered for the lead in Ben-Hur, but all of the three previous films fared poorly at the box office, so Purdom was out. It seems that the success of The Student Prince went to Purdom's head. He had an affair with Tyrone Power's wife Linda Christian, causing his own wife, Tita, to divorce him, asking for child support. He asked M-G-M to renegotiate his contract, but the head of production there, Dore Schary, refused. Purdom walked out. He did the film Strange Intruder (released in September, 1956), then married Alicia Darr, who fought with Linda Christian (the nerve!). Purdom's ex pressured him for more alimony. In the middle of this cheery scene, in November, 1956, Purdom portrayed Richard Denning on Broadway in Child of Fortune, but the show flopped (in New York, anyway). Traveling to Italy to star in the television series Sword of Freedom (which had 39 episodes during the 1957 season), proved to be a great escape for Purdom, who intesely disliked Hollywood. He remained based in Italy for the rest of his life, appearing in countless Italian films, such as La furia dei barbari - Fury of the Pagans (released in October, 1960), and Nefertite, regina del Nilo - Nefertiti, Queen of the Nile (released in September, 1961), with Jeanne Crain. Purdom married Linda Christian in 1962, but the marriage was short-lived. Purdom participated in too many Italian "B" pictures to relate here, and dubbed many Italian films into English. He would occasionally surface in British films, like The Yellow Rolls Royce (released in December, 1964), and A Matter of Time (released in October, 1976). In 1980, he played the director Vittorio de Sica in the television movie Sophia Loren: Her Own Story airing on NBC in October, 1980). In 1984, he directed a horror movie he also starred in called Don't Open Till Christmas (released in December, 1984). Purdom enjoyed being a recording engineer as well. He died of heart failure in Rome in 2009, at the age of 84. Grauman's Chinese Theatre, Hollywood, California. 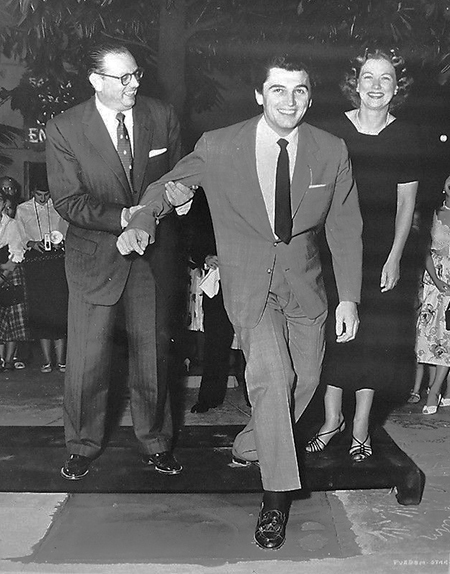 Edmund Purdom Forecourt ceremony, Monday, August 30, 1954. Fox West Coast Theatres executive Edwin F. Zabel assists Edmund Purdom make his footprints, while Eleanor Powell looks on.